This morning, while out grocery shopping, I picked up a few candy eggs. I probably could have chosen a brighter color, but I was also being cheap. The pink wrapped eggs were less than a $1.50, so I went with it. 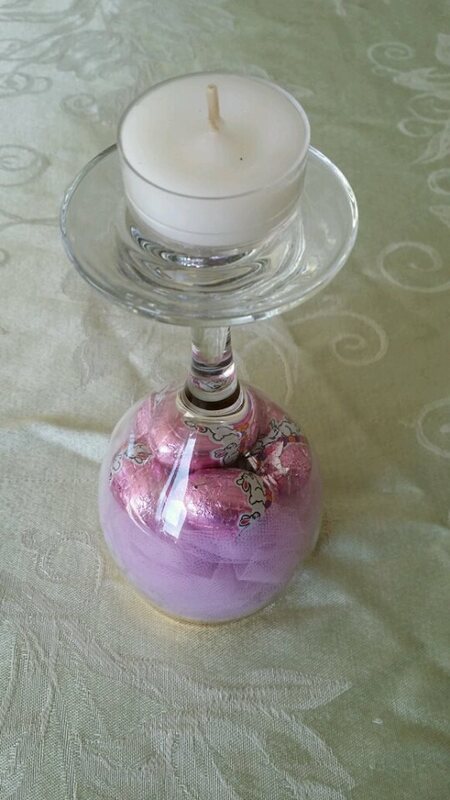 I wanted to make an Easter centerpiece for the diningroom table. You will need: several wine glasses, tulle (or Easter grass), candy and a tealight (or votive) candles. When I got home, instead of using Easter grass, which goes everywhere, I opted to utilize some leftover tulle. Cut long strips of the tulle from the roll, and then bunched it up. Having already added five candies to each wine glass, I pushed the tulle in and flipped the wine glass upside down. I had to add a bit more tulle to each glass so the candy stayed at the top of the glass. When I was satisfied with how the glass looked, I added some white tealights to the top of each glass. Now, my table isn’t overly large, unless I add extra leaves to extend it. I just made three of these and put them in a row on the table. I used a pastel green tablecloth and it made a really cute, simple and elegant centerpiece. Now to find some cute placemats for the table and I’ll be all set. Sadly, I have no idea what roast this was. It was wrapped in a cute little netting. I know, it’s sad. Forgive me. The day before yesterday, when I made this, I only had 4 hours sleep. I’m shocked I actually made it all day, including starting dinner. I didn’t use my seasoning shaker. Another pathetic excuse….it was dirty and I didn’t feel like washing it. What? At least I’m honest. Onto the meal. Either slice some potatoes or onions and lay it on the bottom of the crock. I usually use onions, but felt like potatoes this time around. The veggies become your “rack” to set the meat on. 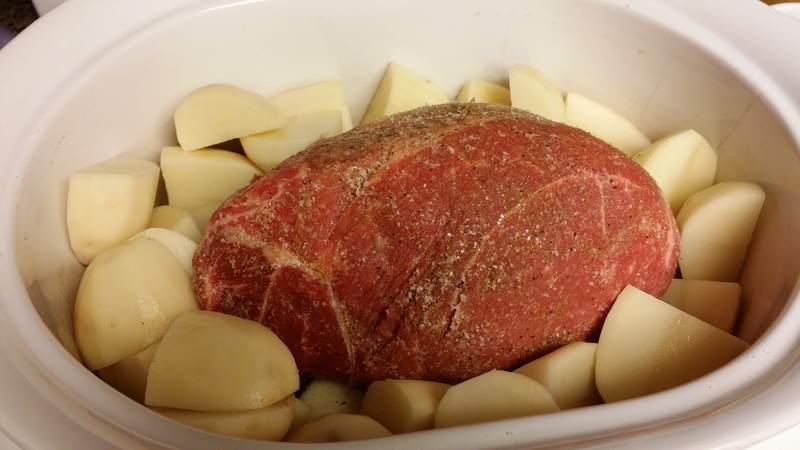 Season meat and set on the potatoes and/or onions you already put in the crock. If you lazy cook like me, if you have red or yellow potatoes, you can just wash and quarter them, as they don’t require peeling. Arrange them around the roast. Next peel and rough chop some carrots (an inch or two in length). Place them around the roast, on top of the potatoes. Add about a half to a cup of water. If you want to make gravy, add another half cup or so. 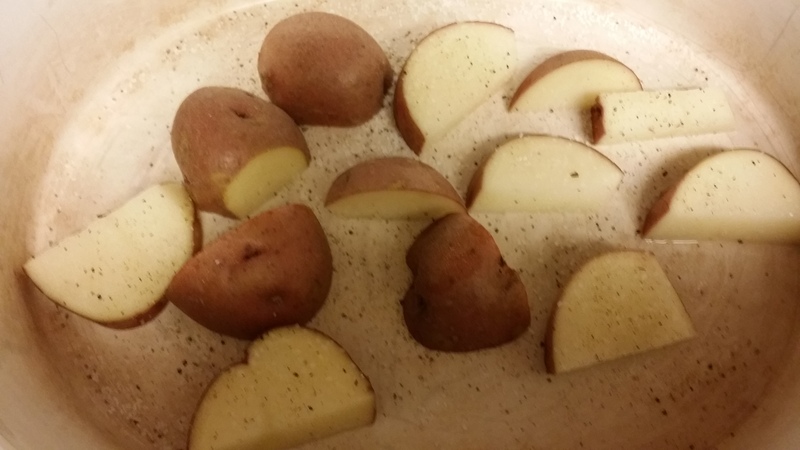 I actually cover the potatoes, because I personally, like the way they turn out when immersed. I set it to cook on high for 6 hours. It was very tender, but I think four or five hours would have been better. 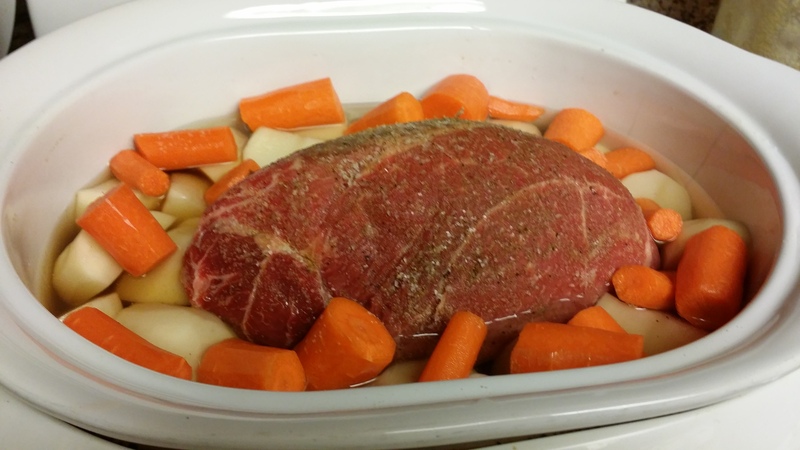 It was a fairly small roast; about three pounds. Another quick dinner. This time, the sides were already included.